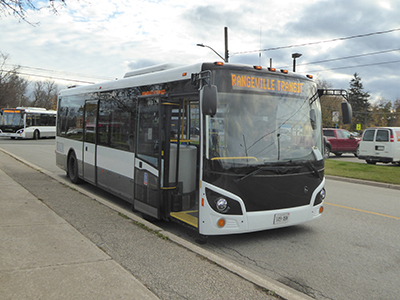 Orangeville Council has finally decided on a location for its long-touted new transit transfer hub, although it will need county approval before construction can begin. Council spent approximately an hour on Monday deliberating over two options presented by the Orangeville Transit Committee, each of which would see the hub located on Centre Street in front of the county-owned Edelbrock Centre. In the end, Council went with the second option, which calls for an island to be installed on the street, alongside layby lanes. This design would allow for two-way bus traffic on Church, while the other option, which didn’t include an island, would have allowed only one-way traffic. The Town needs to seek the County’s approval since this option would involve encroaching on County land. Kicking off the debate, Coun. Sylvia Bradley felt Centre Street was a poor location for the transfer terminal, stating its close proximity to Orangeville’s community garden and growing fruit tree population was a cause for concern. Coun. Bradley asked that Council consider deferring this issue until the new year. When that request fell on deaf ears, she asked why some members were in such a rush to push this project through when, in her mind, a better location for a transfer station may become available in a couple of years’ time. That location is the current Orangeville fire hall, located on Dawson Road. With the municipality facing up to the reality that it will have to fund construction of a new fire hall in the near future. The Town is planning for the projected $8 million expense to come up in 2020. Coun. Bradley believes the hall site, once vacated, would be a perfect transfer station location. Coun. Gail Campbell suggested the Town needed to give county council more than just one location option for the bus terminal. She stressed that the terminal needed to be located solely on Orangeville property so the municipality would retain the right to make any decisions relating to the site. Coun. Don Kidd asked if there was another piece of town-owned land in Orangeville that could effectively house the transfer station. As Council’s sitting member on the Orangeville Transit Committee, Coun. Nick Garisto indicated that every possible location had been extensively looked at, with the committee eventually deciding the layby lane option on Centre Street was the best option. The Town’s Manager of Operations, John Lackey, commented on the situation the transit committee had faced in recent months. In the end, the motion to install an island and layby lane at Centre Street was approved 4 to 3, with Mayor Jeremy Williams, Deputy Mayor Warren Maycock and Councillors Garisto and Campbell in favour and Councillors Kidd, Bradley and Wilson against. A proposal will now go before county council for final approval.